Saturday! Saturday! Saturday! 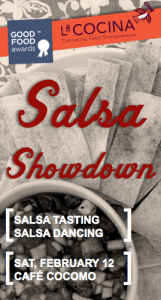 Salsa Showdown! As part of Good Food Month’s Immigrant Food Week, La Cocina is throwing their first-ever ~SAN FRANCISCO SALSA SHOWDOWN~ on Saturday February 12th at Cafe Cocomo from 5pm-9pm. It’s a dual-salsa event with a salsa tasting competition and salsa dancing, plus a grand prize worth $500 for the best salsa recipe. The salsa competition—salsa the food, that is—is open to everyone in the community, so attendees will be tasting epic recipes of all types from home cooks and food pros alike. With or without fancy kitchens, carts, or formal training, anyone can transform raw ingredients into incredible food; just check out the international flair of the list of competitors. What an event, you can support your favorite salsa-maker and shake your money maker!